3 Dimensional Chat / How can I create an object with several meshes using Blender? 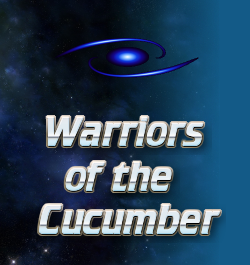 I wasn't sure if I should post this here, or in the AppGameKit Chat forum. Since I hardly ever post in this forum, I thought I'd try here first. I even made a simple model of a plane as a floor with two cubes, each with a different texture but again, despite all efforts, no joy. Is there a reason it needs to be all one object? Have you tried parenting instead of joining the objects in blender, export them together as one object, then use loadObjectWithChildren in agk? @Ortu - No, not really; but it would be easier I guess. I'll try parenting. Thanks for the suggestion. I have tried to get several mesh in one object exported from blender, and I do'nt know why, it doesn't work. if you find a way to export from blender and get several mesh in agk, please tell me how you do that ^^. I continue to search how to do that ^^. - ok, in .x, it work without any parenting. As long as you have different materials/textures applied to 3d items in blender and you export .dae, .fbx .3ds or .x then you get multiple meshes when you load the file into AGK. The exporters only consider breaking it into multiple meshes if there is a reason to do so....different materials causes that. Oh thanks for the informations ! I dont know that all objects should have a unique material or texture. Is it work with . Obj too ? I will try tomorrow, thank very much . Ive not managed to get .obj's to load as multiple meshes and I havent tried it as I dont use .obj much. I tend to use other formats. I have tried a dae, with multi mesh, multi uv, multi textures, normalmap, lightmap, diffuse, all works fine. Agk just miss some internal features like specular for example . Using my demo scene (above, a simple plane with two cubes, each with it's own material/uv map/texture image), the best I managed was a .x file which claimed to have 2 meshes when GetObjectNumMeshes() is called, but when I apply an image to the meshes, only mesh 1 textures something (in this case, the floor plane), applying a texture to mesh 2 did nothing at all. Exporting the same model as a .obj only showed 1 mesh. 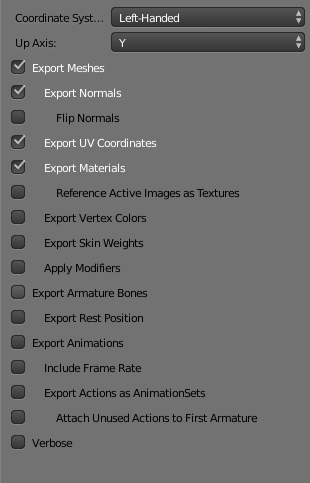 Here are the export settings I used when exporting the .x model. Can someone who has made a model in blender which will work with the SetObjectMeshImage(), post the .blend file here please so I can see what I'm doing wrong? You should try to export in dae, I use this format to export ndit works fine. Create 3 objects separatelyi blender, add them a unique material for each object, then dd aunique texture. Then export all in dae. Tomorrow, i will post ablend file which works. So.... 20 seconds to create a scene with 2 blocks and a ground plane. Assign materials to each object and assign textures to the materials. Add UV's to your object data. That is exactly what I have been doing, but I have not been getting the same results as you. The only difference I can see is that you are using Blender Render, where as I am using the Cycles one. I'll try exporting your model and seeing what happens, (If this doesn't work, it's a problem with my install of blender/agk) and then assuming it's successful, try a Blender Render scene of my own. Quote: "That is exactly what I have been doing, but I have not been getting the same results as you. The only difference I can see is that you are using Blender Render, where as I am using the Cycles one. " Its nothing to do with the renderer used. I can create the models without ever rendering them or switch renderers and still get them to load in AppGameKit fine. Its the setting up materials and uvs that is key to getting multiple meshes. Quote: "I'll try exporting your model and seeing what happens, (If this doesn't work, it's a problem with my install of blender/agk) and then assuming it's successful, try a Blender Render scene of my own." Let us know how you get on....I only did a quick render of that scene so you could see its the same scene in blender to the one in agk. Ok, so I have it working more or less. Switching to Blender Render changes a few of the properties relating to textures, as well as how it handles materials/textures. But it certainly makes a difference. 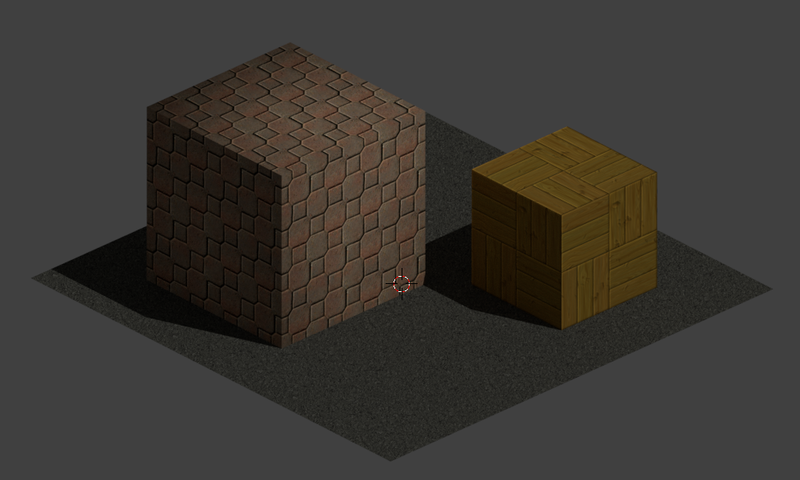 When texturing in agk, how do you specify which UV to use for which texture? I dont know if its possible. When i use several mesh with an object, i should write a shader for it, to have lightmap, normalmap, or other cool features. It could be great if Paul add a feature to set the texture uv by stage. By default, i think all texture textureuv0, except the lightmap which use the textureuv1. Bengismo : the lightmap in agk is very different from the lighting in blender. So we cant have exactly the same scene, except if we bake in the lightmap the colors and diffuse for exemple. But agk doesnt have specular, and other diffuse shader like oren nayar or other. It could be great to have those diffuse and spec shader In agk, at least. If you use your own shaders then you can set which texture uses which UV coordinates. No problem. You can have multiple UV coords for other effects (decals, wave effects,lookups) etc but only in shaders. As Blendman says, with the built in stock diffuse texture uses Stage 0 and UV0 and the Lightmap uses Stage 2 and UV1 if they are included in the model file otherwise it uses UV0 coords (same a s diffuse). Blender uses a raytracer to produce its images (Blender Render or cycles typically) so the render in AppGameKit using Open GL will never be EXACTLY the same as AppGameKit uses open GL in real time. At least it wont without using custom shaders to add all of the rendering features used in the blender render (such as cook torrence specular). The lightmap is an overlay and should only darken the lighting from a set level. You have to remember to turn off the SUN lighting and ambient which is on by default and disable lights if your using lightmapping in AppGameKit or the scene looks too bright as your adding light to light thats already baked into the scene. Careful use of the object diffuse and emmisive colors gets a better result too. AGK doenst have specular built in as a function we can use but specular can be added into a shader fairly easily, its not hard to add a phong shader to do this as I have done it. Ive not got a cook torrence one that will include the lightmap and diffuse in it but I could work on one if I ever get some time so that the scene in AppGameKit would look very similar to the blender render. Its already not far off looking good and its real time dynamic rendering. Just light mapping and bump mapping together looks great and creates quite realistic scenes. If we could add some PBR rendering too it will look pretty great and still run fast. Its all about using the shaders these days rather then some stcok off the shelf architecture. If you have a simple example of a specular shader, im interested, but would it work with normalmap too ? Specular and normal maps work well together. 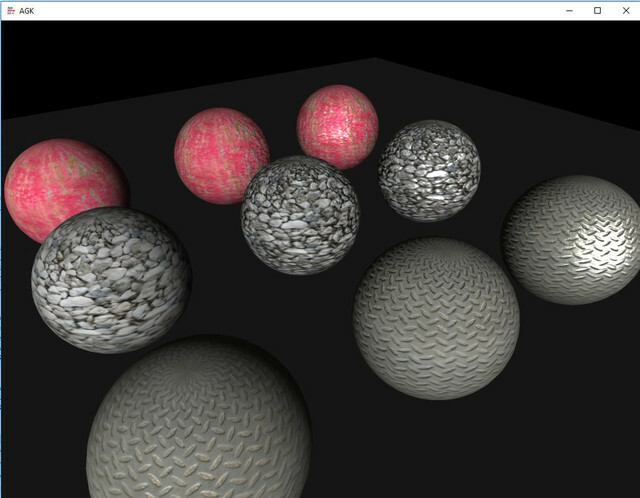 I quickly created 9 spheres with 3 different textures. What i want to do is... true reflected specular mapping (via cuba maps/dual parabolic texure) and will attempt to work on that when I get a chance. What is the shader 3) ? Could you post the code of this shader ? janbo has a true reflected specular mapping via dual parabolic texure in his shader pack. Yes...... but I want to know how to do it, how it works and how to program shaders....not just use them without a clue of how they work. If Blendman wants a Specular shader then he could use Janbos shader pack. Hi all, i seldom visit this subforum and i just follow this thread. My question: what are we trying to achieve here? Is it something level export? Where all the meshes export as one? Ok, so I think I finally managed to get model to texture the way I wanted it to! Thanks everyone for the help with that. I'm trying to make a low poly background scene for a game I am working on.